According to research done by telecoms.com and Tata Communications in their Intelligence Future of Mobile Networks, the 5G network may be as little as three years away. 18% of telcos surveyed in this survey think they may be 5G ready as early as 2018, however most respondents (two thirds) said they expect to be 5G ready by 2020 which follows general industry expectations that this is when the first 5G services will go live. Tata Communications warns against jumping the gun on 5G advertising though as industry standards have yet to be defined, let alone confirmed, and think that one of the reasons marketers are jumping on board so quickly with ‘pe-5G’ marketing is because of the wide array of technologies already being positioned to help contribute to the eventual 5G network standard. 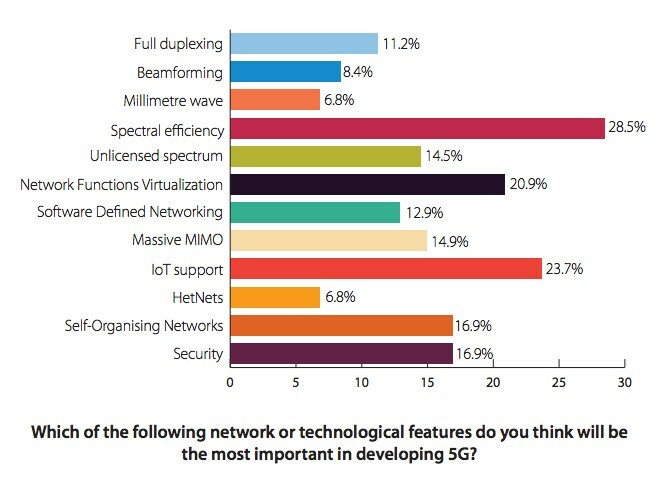 Respondents were also asked which technology they think will be most important in developing the 5G network. Spectral efficiency took the lead in this with 28.5% of people voting for it, which indicates that people are very interested in how to use finite spectrum resources better. This could be because of the expected growth of the Internet of Things (IoT), which corresponds with the feature that came in second – IoT support (23.7%). From the above graph detailing the rest of the responses, we can see that people have a wide range of opinions on what is going to be important in developing 5G but that the main concern is developing the correct technologies to solve the problem of carrying an exponentially growing volume of traffic over a finite amount of spectrum. The leading commercial model with 28.5% about carrier billing and M-Wallet applications supports the results gathered from respondents that Payments will be the opportunity to receive the biggest boost from 5G over the next five years. Movement to an all IP mobile environment was also discussed with the statement most agreed with being “It will enable seamless mobile 10 voice and data communication services between mobile networks and Wi-Fi service providers internationally”. The rise in Voice over LTE (VoLTE) will ensure that people never have to leave an IP network while using their devides which will open up a number of new opportunities for switching between cellular and Wi-Fi data dynamically. It is expected that VoLTE will be an established part of the mobile infrastructure by the time 5G is in action. The survey ended with 75.9% of respondents answering “Yes” when asked the question “Do you believe that new generation networks will fundamentally change the mobile ecosystem?” which is no surprise to us. Commercial 5G services may be a while away (ETA 2020 or later) but ‘pre-5G’ is already here with companies across the telecommunications industry keen to have their brands associated with 5G today and it would be good for the telecoms industry to keep in mind that many of the challenges faced with previous generations of mobile technology will no doubt have to be faced again with 5G. These include; standardisation, cost of roll-out and consumer education of the new network. However it’s good to note that the potential rewards are even greater than before as there are more people and devices set to do more things over more networks. Most people are going to be able to have a stake in the development of the 5G network as mobile technology is going to help increasingly define the face of commerce in the coming years. The full report of the ‘Intelligence Future of Mobile Networks’ survey, covers securing the mobile network, the upcoming 5G network, VoLTE implementation and the future of network assurance and can be downloaded here.